A Closer Look at Five Nights At Freddy’s – The Ride! Jacksonville, FL: Sally Corporation, the dark ride specialists, recently introduced an all new interactive dark ride concept themed to one of the world’s hottest IP’s at the International Amusement Parks and Attractions Expo held in Orlando, FL Nov. 15-18. Sally’s Five Night’s At Freddy’s display, featured the brand’s iconic character Foxy standing behind a stage curtain, and provided a jump scare and a smile to the thousands that approached him on the show floor. “Five Nights at Freddy’s” is a wildly popular series of intense thriller video games designed by Scott Cawthon. First released in 2014, it quickly rose to the top of iOS and Android app stores and now has over 10 million paid downloads worldwide and over 16 billion YouTube views. It is also currently one of the top selling entertainment brands in retail and toy distribution and has a novel on the New York Times Best Sellers list. 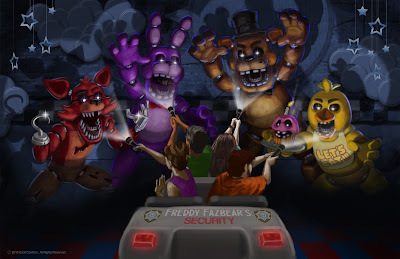 Five Nights At Freddy’s – The Ride is designed to be a real-time, multi-player version of the popular video game, “Five Nights at Freddy’s”. This dark ride mixes gaming, animatronics, large scale video projection, special effects, and immersive sets and scenery. Fans will feel as if they have stepped inside a life-size version of their favorite video game as custom ride vehicles take them through a variety of scenes, both virtual and practical. "I've always felt that Five Nights at Freddy's would make an amazing dark ride, and Sally is the perfect company to make that happen!" says Scott Cawthon, creator of “Five Nights At Freddy’s”.